The VersaMatic® is designed to do what its name implies – be versatile and completely automatic. Because of this, the user has far more flexibility in his capacity to handle customers’ needs, is able to provide quick turns on new orders, and can do it all with greater profitability. VersaMatic can handle up to 4 heads on 115 mm centers, while still taking up 30% less floor space than other machines in it’s class. The VersaMatic® blow molder from Jackson Machinery is a proven design incorporating improvements in system hydraulics and control, affording maximum up time and excellent container quality. 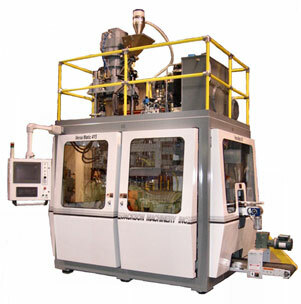 Designed for fast mold changes, the VersaMatic® is a money-maker for users even under short-run conditions. It can accommodate center distances from 115 mm to 165 mm with just manifold and blow pin bracket changes. With its standard Barber-Coleman MACO Compact controller, set-ups can be recalled from memory, allowing previously run bottles to be brought back on line quickly. This quick changeover capability provides better economics to take on new business. The clamp shut height is adjustable from 8.5 to 11 inches, eliminating the need for backing plate changes in many instances.